WATERLOO – As part of Ontario Research Week, Wilfrid Laurier University’s Department of Health Sciences and the Balsillie School of International Affairs (BSIA) will host a 2030+ Group talk Wednesday, April 1 in the CIGI Campus Auditorium in Waterloo, starting at 7 p.m. The Global Health Challenges panel and discussion will highlight recent research from the 2030+ Group, which pursues collaborative research on emerging challenges in the areas of food security, poverty, health, migration and climate change. The 2030+ Group includes experts Jonathan Crush, Simon Dalby, Dr. James Orbinski and Alan Whiteside. 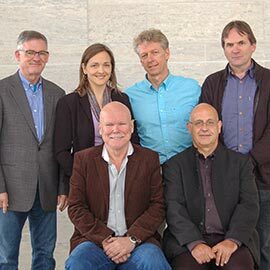 Each holds a Centre for International Governance Innovation (CIGI) Chair at Laurier and teaches in the Master of International Public Policy and PhD in Global Governance programs, both located at the BSIA. The panelists will each present on a major global health challenge, then participate in a Q&A discussion led by Laurier Health Sciences students and alumni, and moderated by Peter Tiidus, chair of Laurier’s Department of Health Sciences. Jonathan Crush will present issues of food insecurity and inclusive growth in rapidly growing cities in the Global South and the research of the Hungry Cities Partnership. Simon Dalby will discuss balancing responses to climate change and the urgencies of health care agendas. Dr. James Orbinski will frame emerging international work on global public health security and links with country-level health systems. Alan Whiteside will discuss the international context of HIV/AIDS financing and the impacts of treatment as prevention. The event runs from 7 p.m. to 9 p.m. and will feature a panel presentation and discussion session, followed by a reception. The evening is free and open to students and the public. Seats are limited, and registration is recommended. The CIGI Campus Auditorium is located at 67 Erb St. W., Waterloo.